Well the final week has come and it is with some sadness that I relinquish my regular spot on the blog! It has been an amazing three years guiding and I want to thank all the rangers, trackers (Simon Mathebula and Lucky Shabangu in particular!) 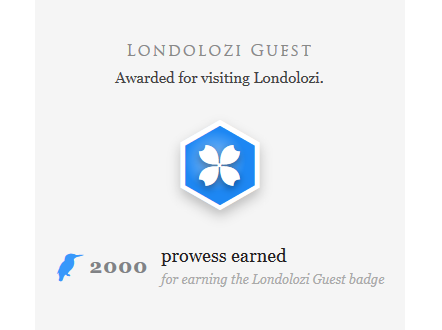 Londolozi Staff and guests for making the hours out in the bush so memorable. Whether on official game drives or staff “bumbles”, without the people to share it with the experiences would never be as meaningful. Thanks to Rich Laburn for giving my own spot to put up some of my pictures, and to everyone who takes the time out of their day to look and comment on them as well. I hope everyone enjoys this final post-and until I can accumulate enough photos for for a post from the finance office (which may take a while!) 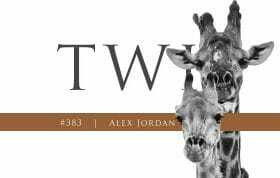 I will revert to being a faithful follower of the blog and the lives of the animals I have come to know so well over the past three years. 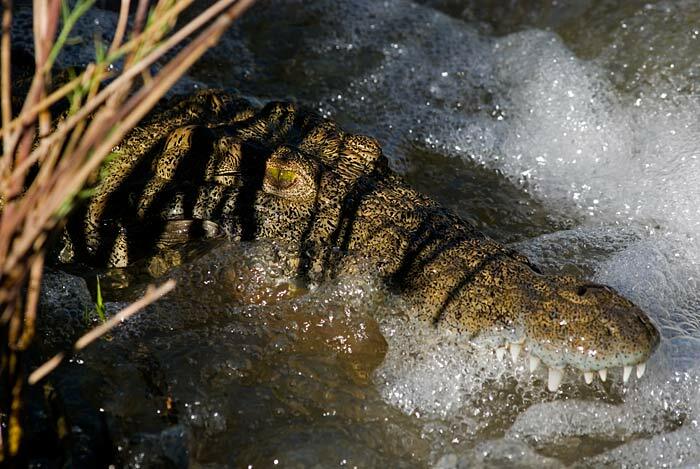 A crocodile waits patiently just downstream of the causeway crossing the Sand River, hoping for something to swim between its jaws. This croc was a regular feature of crossing the river and you could predict with some certainty his presence at almost exactly the same spot every time you crossed! 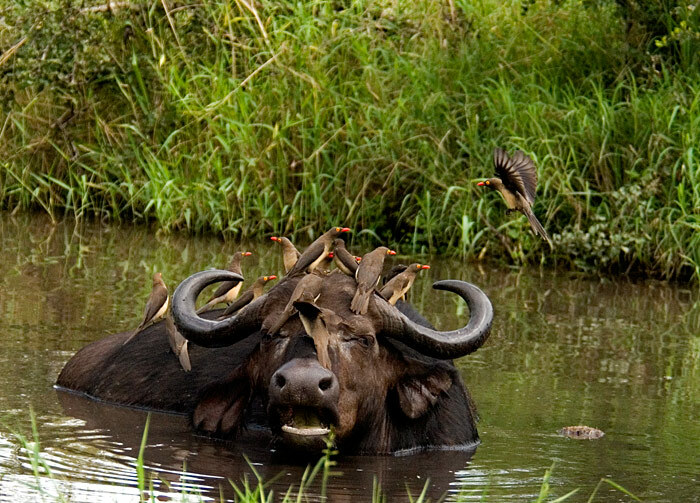 A group of red billed Ox-peckers have a party on the head of a wallowing buffalo cow. This was part of an incredible sighting of a large herd of buffalo and the Southern Pride. 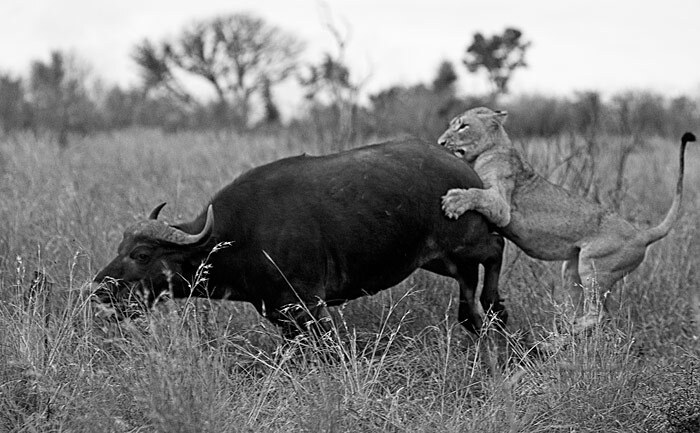 Soon after this, in the midday heat, the lions began to hunt the herd. 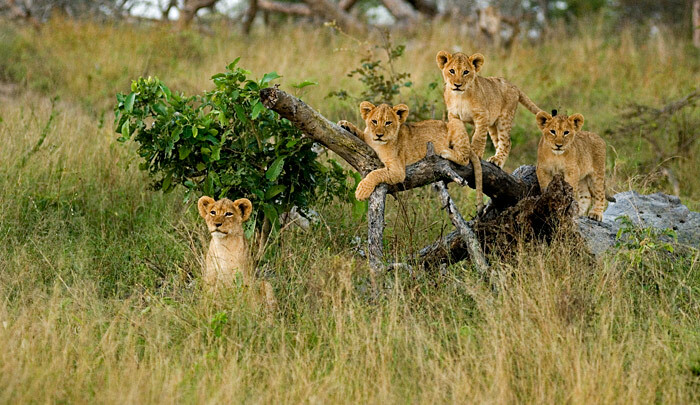 This section of the pride at the time consisted of five young males (one of which is now dead) and one young female. This young male was a little more adventurous than the rest and almost paid the price. He headed in alone and quickly found himself surrounded, his only refuge this low fallen tree. 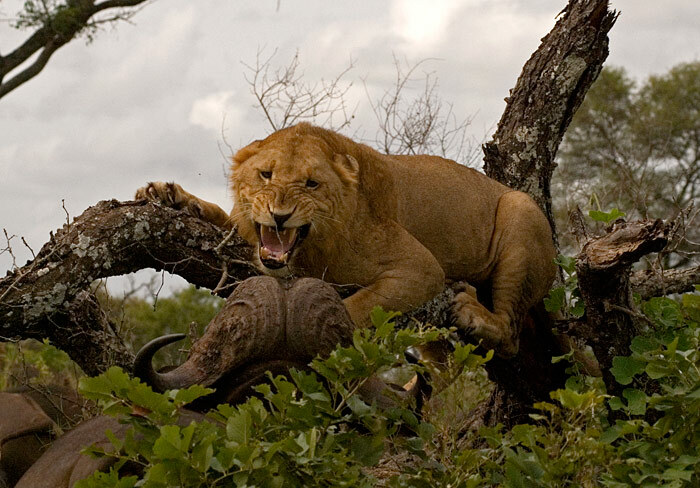 An angry buffalo bull faces up to him. 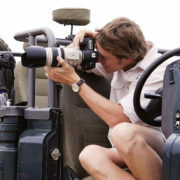 This was one of a number of memorable sightings we had on a twelve hour game drive on the photographic vehicle that day. 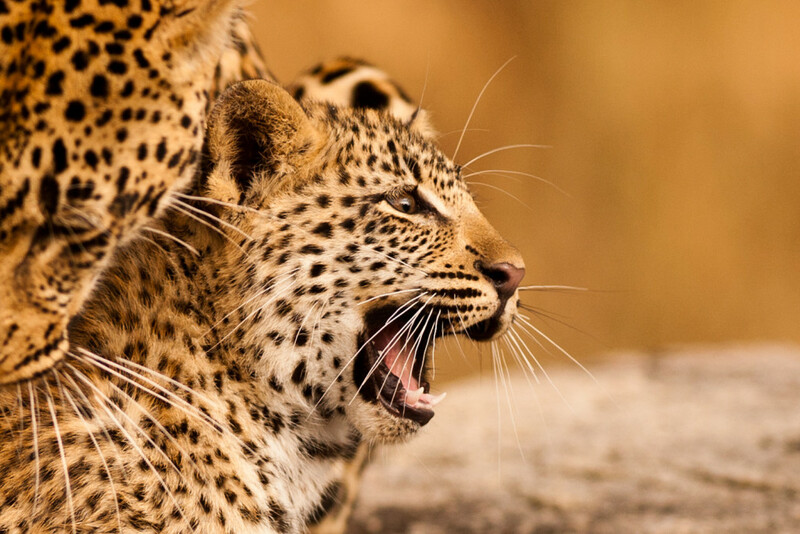 The four older Tsalala Cubs (born at the beginning of 2011) look on at a group of rutting impala rams. 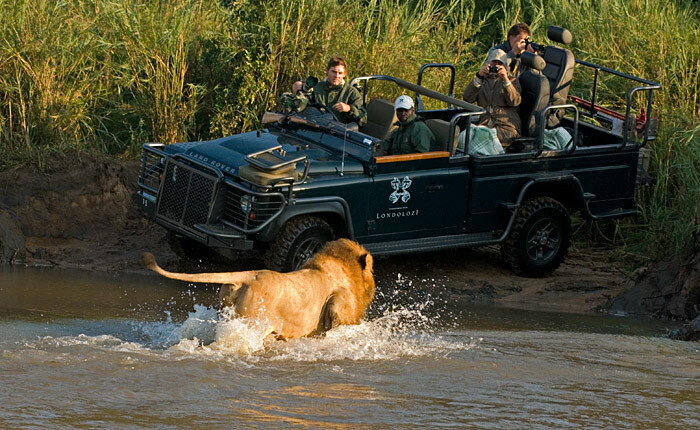 The pride spent some weeks in the vicinity of Ximpalampala Koppie during the rutting season. 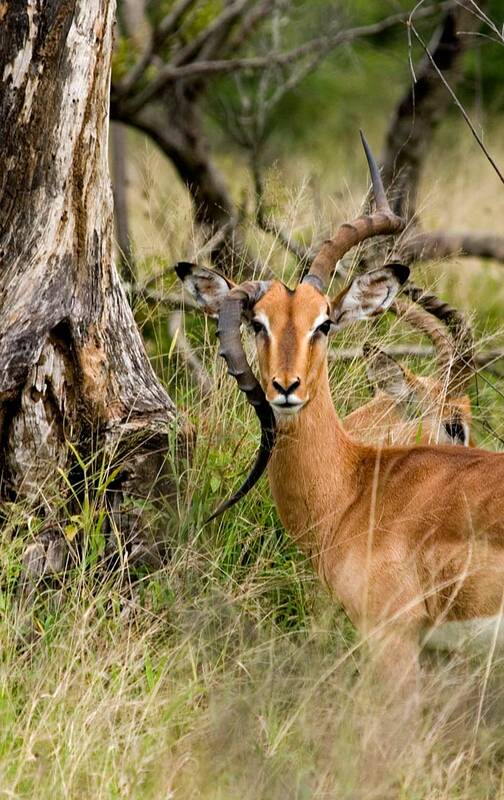 It is prime territory for an impala ram and many of them gather there to fight for the best areas. They are so fixated on competing with each other, that they become relatively easy prey, ensuring that only the strongest and sharpest of them get to survive and breed. 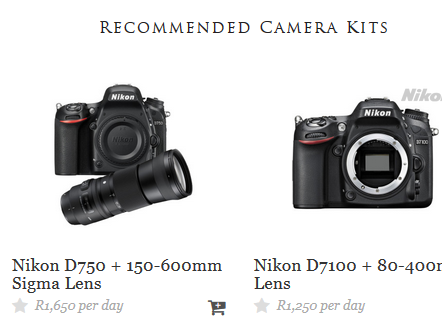 There is quite a lot of friendly competition amongst the guides when it comes to photography. Here, however, I actually felt truly sorry for Richard Ferrier, the guide in the photo. 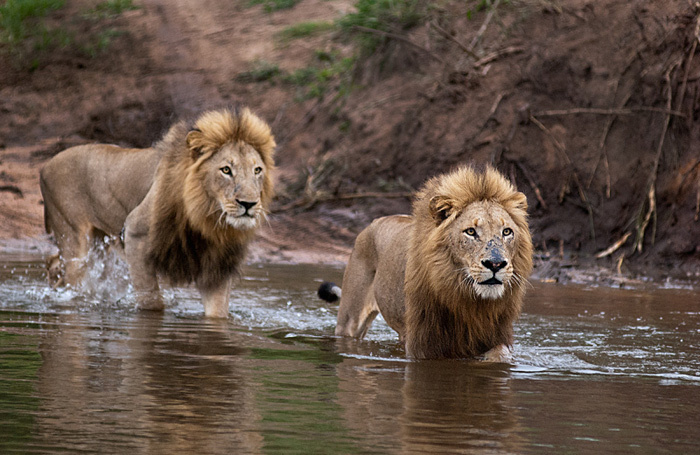 After following two of the Majingilane males for some time we realized they were going to cross the river. We looped up ahead of them in order to watch their approach and crossing, and while we were waiting, Rich mentioned that he had been waiting seven years to get a shot like this! Unfortunately his faulty battery went flat after just one shot-the look on his face in this picture as he watches the second male cross says it all. It is one of those mornings where you remind yourself that sometimes it is good just to take it all in. We really can get too fixated on what we see through a viewfinder, and forget to sit back and just enjoy it for what it is. This was funnily enough taken in the same sighting as the previous shot. We had positioned ourselves for the lion's approach, when this elephant bull decided he was going the other way before they arrived. 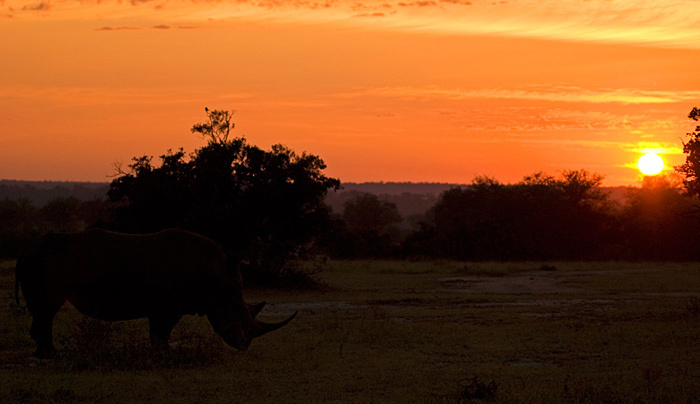 Londolozi's "Open Areas" are very different in appearance from the vast majority of the surrounding terrain. As the name suggests, it is characterised by few trees, long grass and beautiful views. 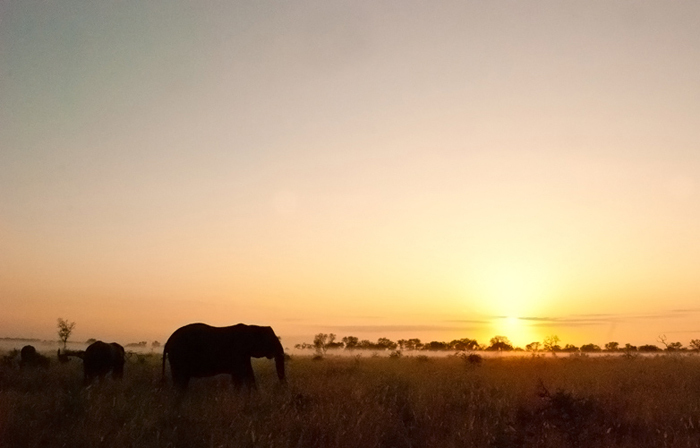 If you can get down there before the sun is up it can present some beautiful photographic opportunities, particularly if there are some elephants to add to the scenery. 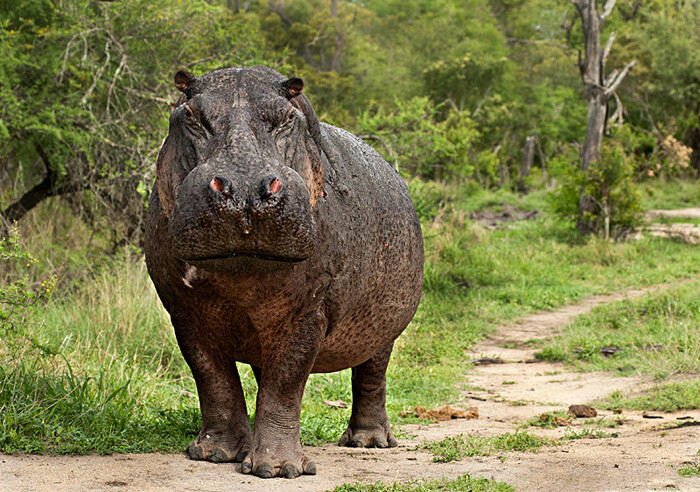 There are a number of pans in the southeast of Londolozi that are small and shallow and often play host to a displaced hippo bull, forced to take refuge in what is by no means a prime spot for a hippo after losing his grasp on his territory. We spotted this bull on his way back to Tortoise Pan. Usually if they are approached out of water their first instinct is to run for cover or water. This male though was surprisingly calm, lumbering up towards us before easing back into the comfort of the cool water. Although he was by no means aggressive, he does seem to have a seriously angry face! Speaking to guides who have been at Londolozi for many years, there were times when a wild dog sighting was a once a year occurrence. 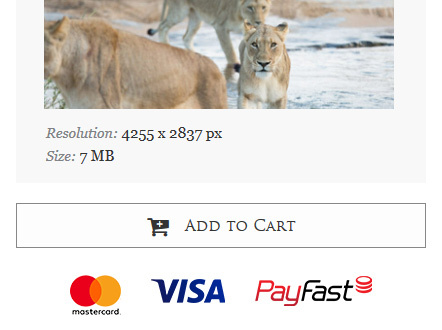 Although sightings are by no means frequent now, I was fortunate that during my time there was a pack that was largely resident in the Sabi Sand, resulting in far more regular sightings of these phenomenal hunters. 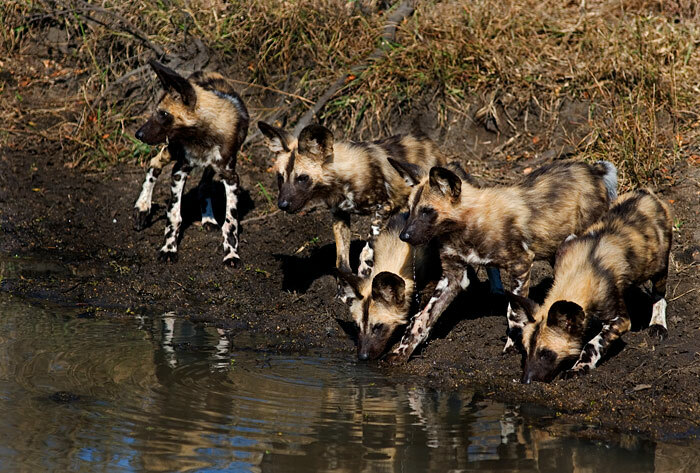 Here five of the pups from the 2011 litter nervously take a drink from a shallow pan, knowing full the well the affinity of crocodiles for water and an easy meal. Quite an apt shot considering Adam's last post. 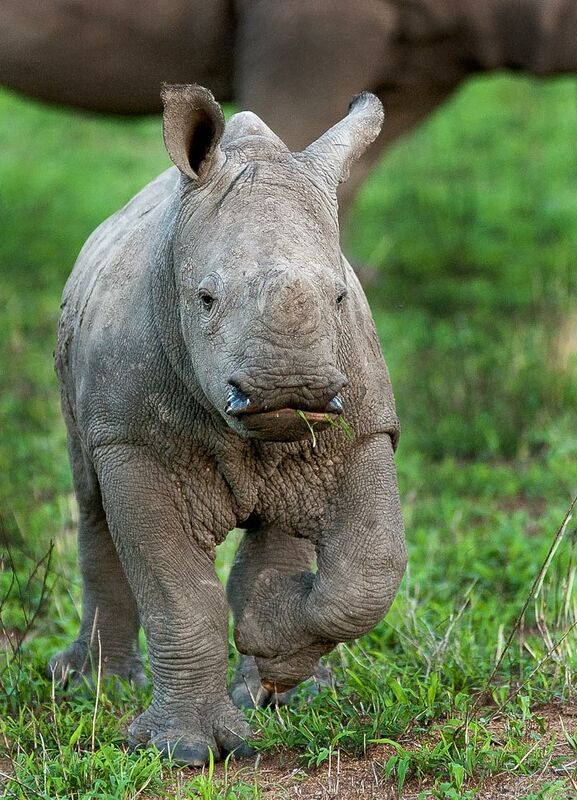 An inquisitive White Rhino calf trots up to investigate the vehicle. 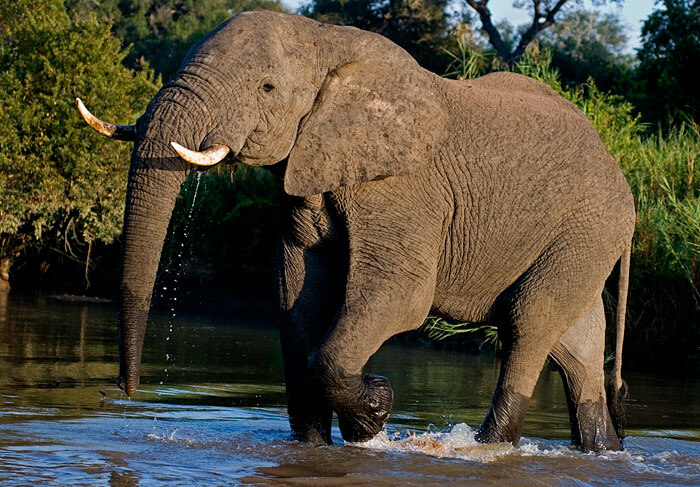 Unfortunately these animals are being poached at a rate of one every eighteen hours in South Africa alone. 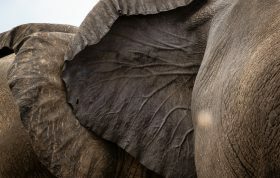 Some people have been of the opinion that w should not even post pictures of these animals so as not to draw attention to them and their whereabouts. 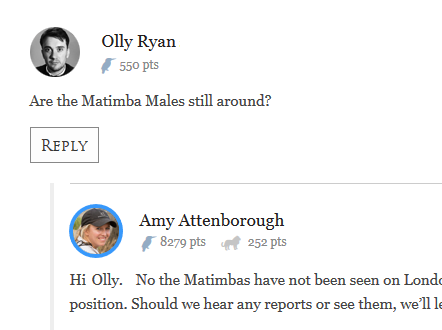 However I feel a post like Adam's does far more good than harm in forcing them and their plight into the forefront of the minds of people who feel as strongly about their continued conservation as ourselves. After some time taking photos and learning about your camera, you are able to experiment a little with different techniques. 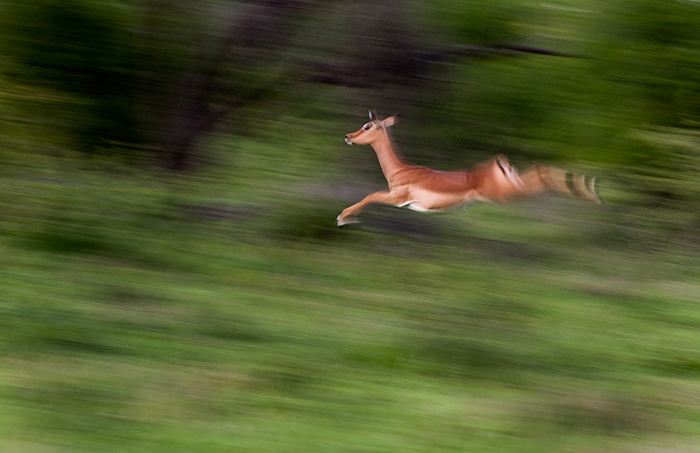 This motion blur technique is one I tried a few times and very seldom got right, with this probably being my favorite of the lot of an impala ewe in full stride. Just after heavy summer rains there is often an emergence of termite alates. They leave the colony in order to start a new one, with the softened soil aiding their cause. However they are not particularly good flyers and provide and easy, protein rich meal for many of the birds, ranging in size from the tiny Yellow Fronted Canary to the enormous Steppe Eagle. 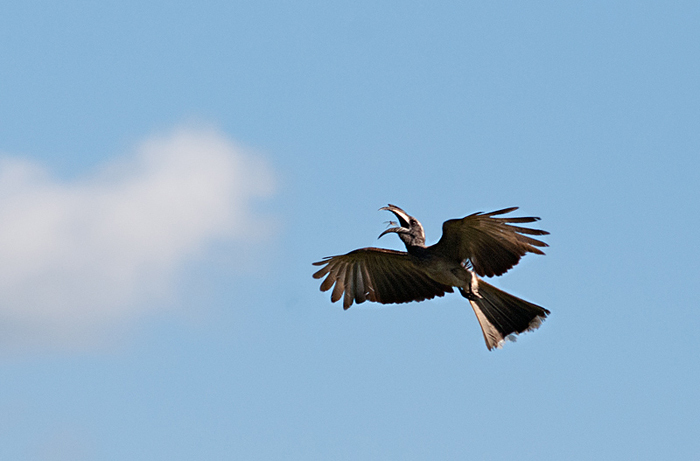 Here, a Grey Hornbill gets in on the act,about to snap up another alate. 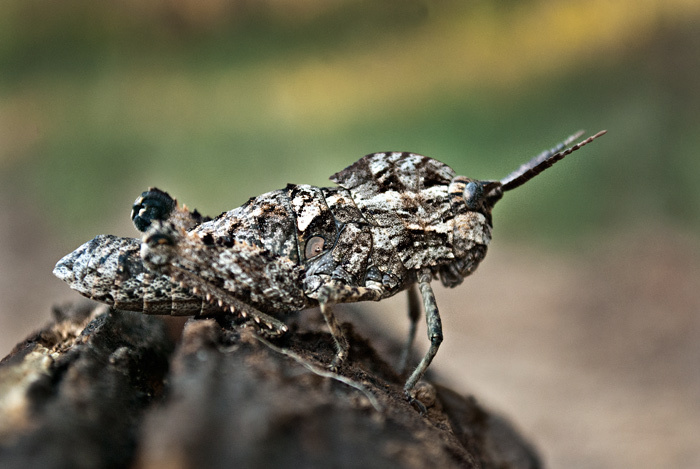 A Horned Hopper sits camouflaged on a fallen branch. We were having a braai (barbeque) with a number of rangers and trackers in the Maxabene drainage line when I noticed this little guy sitting quietly behind us. Over time, nature shows you a few weird and wonderful things, none more so than this impala ram's strange horn configuration. Likely born with this defect, it hasn't hindered him in anyway and he has been seen a number of times. This is also a perfect example of evolution at work (although it usually works in far smaller increments! )-a birth "defect" turns out to be beneficial and is passed on. Should he be slightly more successful than other impala due in some way to his horns, his genes would be more likely to be passed on. Come back in a few million years and maybe all impala will have horns like this! This was a sighting I was fortunate enough to spend with my brother and my mom. We noticed a number of vultures roosting together and soon found one of the Majingilane males on a buffalo kill. 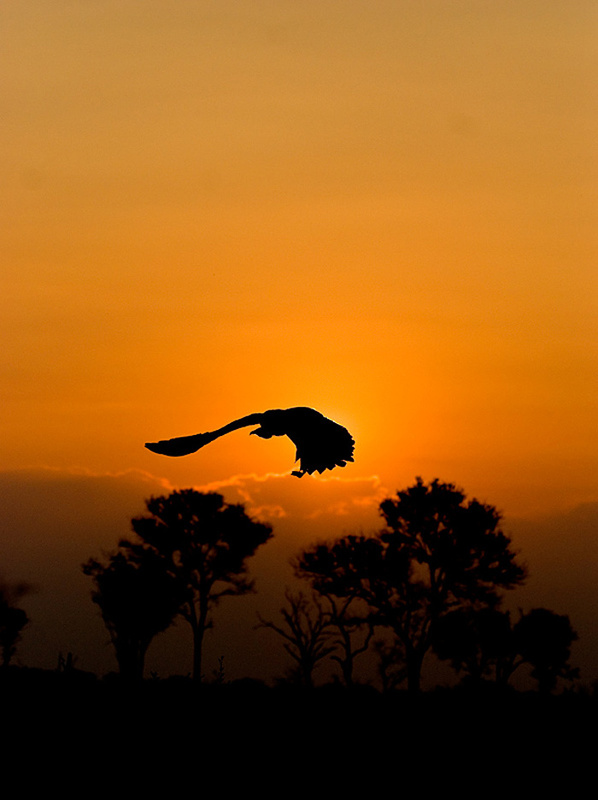 Whilst waiting for him to wake up I managed, almost by accident, to capture this shot of a vulture as it flew across the setting sun. 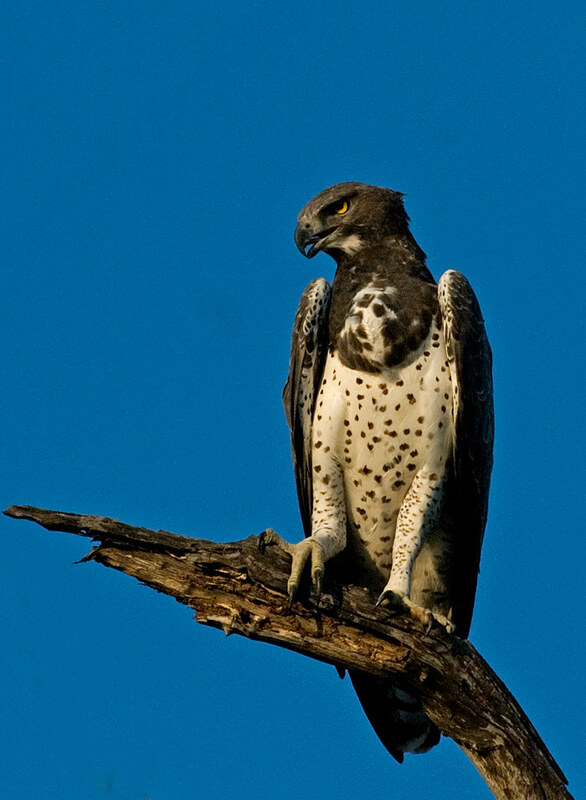 Ximpalampala Koppie and the Tsalala Pride are synonymous for many guests and rangers. 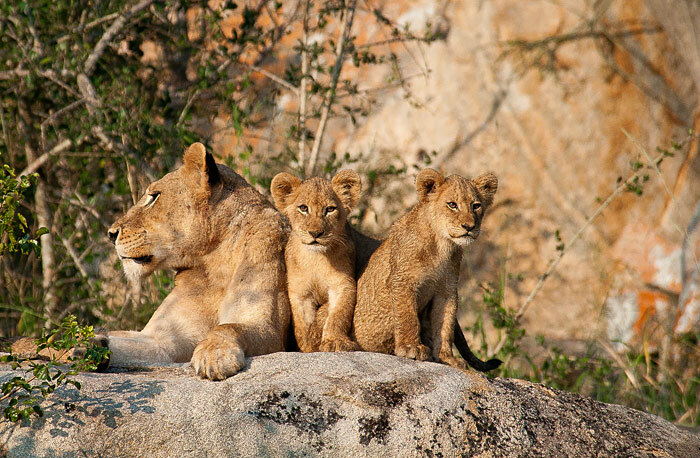 The pride's females have used the shelter of the rocks as an ideal den site for their cubs on almost every occasion they have given birth. Here two of the four older cubs (2011) look out over their new home soon after sunrise. The second female was lying at the base of the Koppie, next to our vehicle. Heavily pregnant, she was to give birth to her own litter of four soon after. 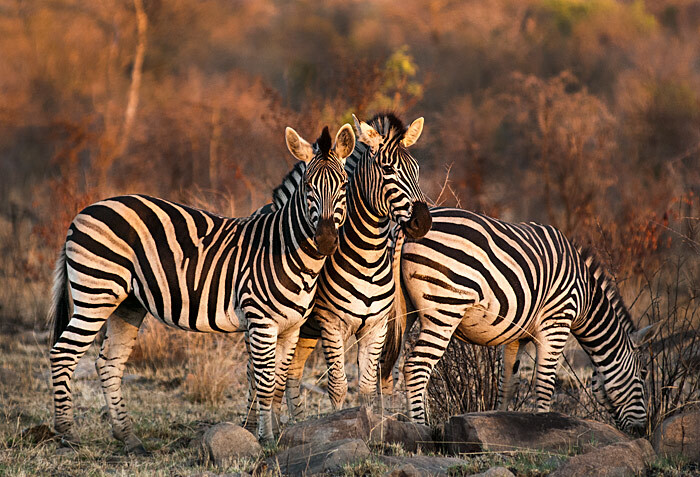 A dazzle of three zebra stand together in a burnt area at last light in winter. Not in the frame here, but the pack of nine wild dog had surrounded them, with the zebra and dogs taking turns chasing each other before the dogs finally moved off to try and find some more realistic prospects for a meal. If I had to choose one photo from the last three years as a favorite, this would probably be it. 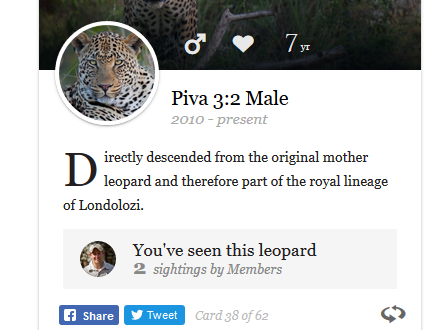 It was the culmination of a twelve hour sighting of the Tsalala females. 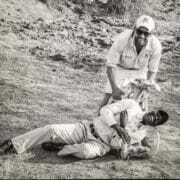 We had found them early in the morning and watched the two hunt and kill an impala. They took their time in finishing it and as the heat began to build, so the other vehicles left for breakfast. Fortunately I was out on the photographic vehicle which meant we were out all day if needed, and was accompanied to two very enthusiastic and fortunately very patient guests in Clayton Surrat and Mary Sue Farley, who were spending a week with us. Knowing that both females had cubs, we had decided to spend the entire day with them in the hope of being led back to the den. After finishing the impala they went for a drink and began a very long and slow walk back to Marthly Pools, a section of small rocky outcrops along the Manylethis which they were using as a den at the time. We reached this spot at about midday, but rather than call the cubs out, they flopped into some shade and slept under the weight of their full bellies. Four hours later, they finally awoke-and walked straight into a section that was impassable in a vehicle! 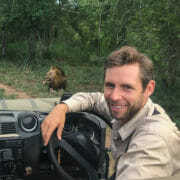 By this time, Talley Smith and Freddy Ngobeni had joined us in the sighting and thankfully saved the situation. Somehow they managed to get a vehicle in from a different access point, although this took another hour or so. Finally we rounded a corner and were greeted by the sight of all eight cubs chasing each other around the rocks. We spent an amazing last hour with them, with this one flopping down on a rock next to our vehicle for a break. The most valuable lesson from this is one which will serve anyone well, whether on safari or not, and that is the value of patience-nothing really worthwhile ever happens quickly or easily. Thanks so much Jeff and Co! Will see what I can do about a Pangolin in the meantime….! Wow, what a fantastic collection of photographs. I came across a saying the other day – Memory is the treasury and guardian of all things (Cicero) – and my goodness you must already have a treasure trove of wonderful sightings which are yours forever. Wishing you every happiness, and thank you for sharing your knowledge and blissful photos with us all. Happy number crunching!!! P.S. When I saw your last photo – I fell in love …. Incredible Doyle. 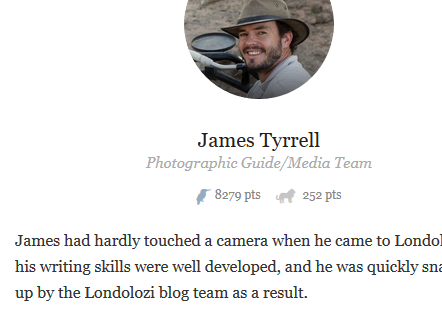 You can be very proud of a great portfolio of shots from your time out in the field. 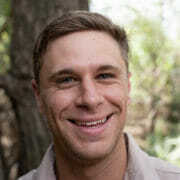 You’re provided many people with an opportunity to see the bush without physically being there and your presence in the ranging team will be missed by them and the rangers and trackers alike. Wonderful pictures. The Tsalala cub is my favorite too. 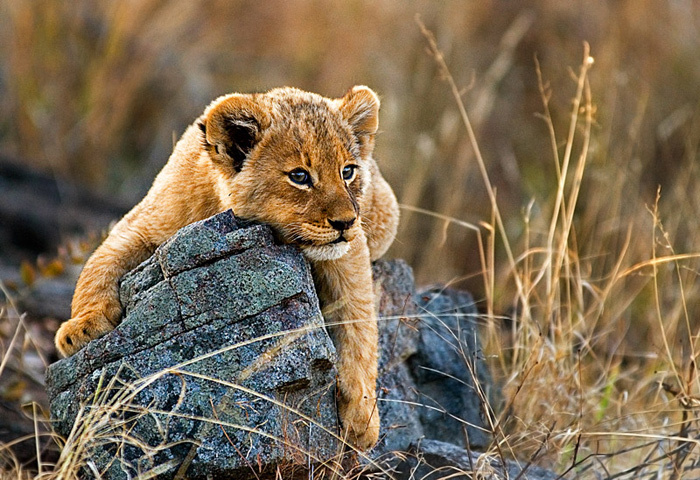 I have a similar picture from my trip in August (although not nearly as good as yours) of one of the cubs on a rock. I look at it every day on my computer screen and smile. Your talent will be missed. Best wishes. These are some of the most incredible photos I have ever seen, Doyle. I wish you all the best in your new adventure. Thank you for sharing your photos and blogs over the past 3 years. God Bless you. What a joy your pics are and I can only imagine the wonder of those you didn’t get to share. I ope your new work will bring you as much joy as the experiences which resulted in these pics has done. 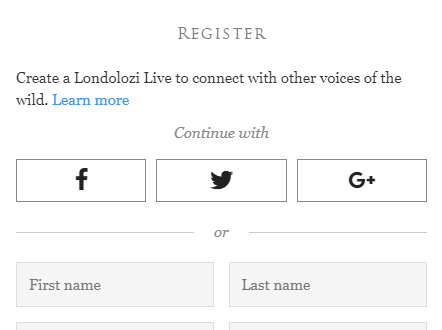 Thank you for sharing Londolozi, the bush, and its inhabitants with us. 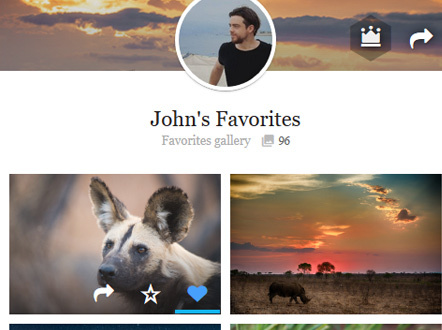 Thank you for your shared memories and gorgeous photos…makes me ‘homesick’ always to see some of the same beautiful animals captured by you in still life. You have a gift and we appreciate your generosity! ‘May trails rise up to meet you, may your heart rejoice in song, may skies be fair above you’…..best of luck and keep us posted!!! Doyle these photos are incredible, thank you for sharing them with us! 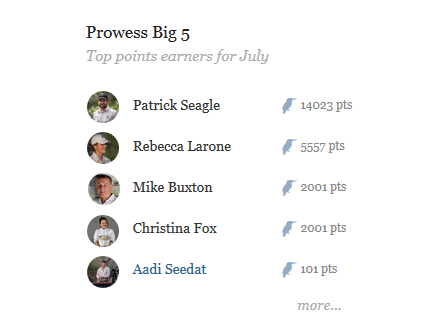 Your blog has been a wonderful treat and much loved addition to my week. Good luck in the Finance Team, i’m sure you will excel. Thank you for sharing these memorable photos with us. We loved our last 2 safaris with you and were selfishly hoping you would continue another year so we could safari with you again this year. At least we have some great shots to help us remember our adventures. Best of luck in the new role! 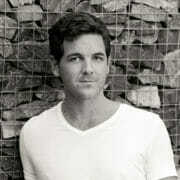 I will miss your photos and I hope we will see more later on. Don´t be one of those boring office photographers that are sitting all day longing to go out and shot but ending up in front of the computer instead. Oh, no that is me! John Varty I been watching you sense i was kid Great Video…. 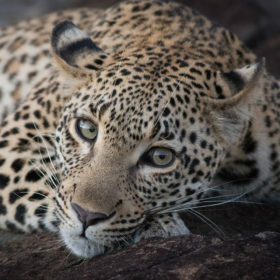 I saw Leopard Queen on Nat Geo wild Made me cry.You are phenomenal great story taller.For two Decades worth of footage with leopard Manana’s life for 17 years sad ending.I know we all have to go some day.i had many tears shed watching the documentary.GOD BLESS YOU JOHN VARTY!!!!!!!!!!!!! Clayton and I are just thrilled that our time together resulted in your favorite shot! We talk ALL THE TIME about that day and how amazing it was (actually the whole trip was amazing). We also tell everyone how accommodating you and the rest of the staff were. Insofar as the original plan was to return to camp, it was great to have the flexibility to stay out and have breakfast brought out to us. And then lunch. And then early sundowners. SO fantastic!